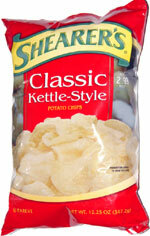 Taste test: These chips had the taste of other soybean oil-cooked chips, but they were noticeably crunchier. It's a much different taste than other kettle-cooked chips, such as Cape Cod, with an intense, salty, moist potato flavor. If you like that taste, these are a great choice, because they've got quite a bit more crunch than other chips with this sort of taste, such as Mister Bee's or Ballreich's. Smell test: Very potatoey, sort of like raw potatoes.